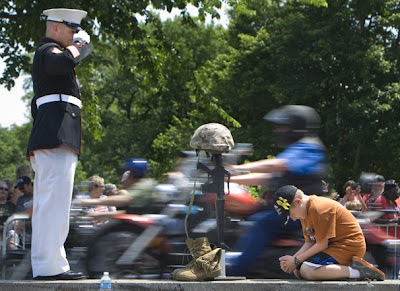 Christian Slayton, 12, prays while Marine veteran Tim Chambers salutes fallen service members during the Rolling Thunder ride in Washington. Chambers holds his salute for three to four hours as bikers ride by. Slayton, who is from Raleigh, N.C., joined Chambers on the median for a moment to say a prayer of thanks for all the veterans, living and fallen.